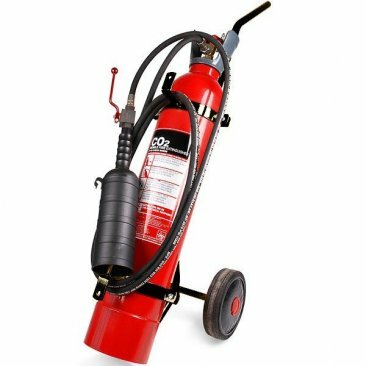 Available as the original single cylinder version, the 10kg CO2 fire extinguisher is fixed to a trolley with large wheels to enable you to get it to the fire as quickly as possible, whether inside or out. Double cylinder versions you can see on the Internet no longer exist as they did not work effectively whereas the single has just one control valve. It is easily refillable and can be maintained by any company. The single model is the same as the Chubb Fire 10kg CO2 fire extinguisher. 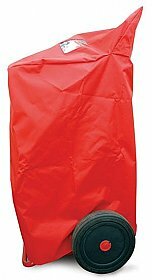 Despite being a lot heavier than portables (but, you won't be lifting it), wheeled fire extinguishers are simple to use. Just twist the wheel at the top of the valve, pull the large nozzle out of the holder, uncoil the hose, head towards the fire and twist the lever on the nozzle.